Do you want to attract more attendees with some LIVE edu-tainment? 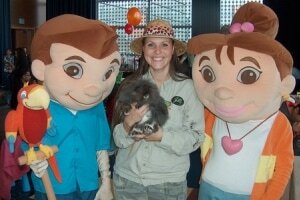 Then look no further, Jungle Jill's Animal Encounters will bring live animals to LIVEN up your next event! ​There are numerous options as to what can be offered at large events or parties, it just depends on what you are looking for and what would best suit your event and crowd size. THIS TYPE OF SET UP IS GREAT FOR LONG, LARGE CROWD EVENTS. 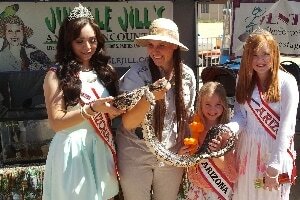 Jungle Jill will set up on 2-3 6ft tables (depending on the amount of space provided) and have a variety of animals (snakes, tarantulas, scorpions, tortoises, lizards) displayed in aquariums for constant viewing throughout the event. The are a few hands on options as people filter by, Hissing Cockroaches, snake skins, etc. Some other larger animals (monitor lizard, boa constrictor, birds) will also be available for viewing on a rotational basis throughout the event, some of which are available for touching. This type of set up is great for all ages and for accommodating large numbers of people that can filter by at their leisure. 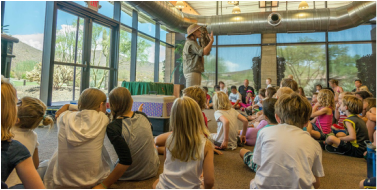 THIS PRESENTATION WILL CAPTIVATE ALL OF YOUR GUESTS, YOUNG, OLD, AND ALL AGES IN BETWEEN! IT WILL LEAVE THEM TALKING ABOUT YOUR EVENT FOR WEEKS, MONTHS, AND EVEN REMEMBERING IT FOR YEARS TO FOLLOW. ​The typical 'show style' presentation is a 45-50 minute program which consists of 10 animals that you get to choose, so you can customize the program to meet your needs. 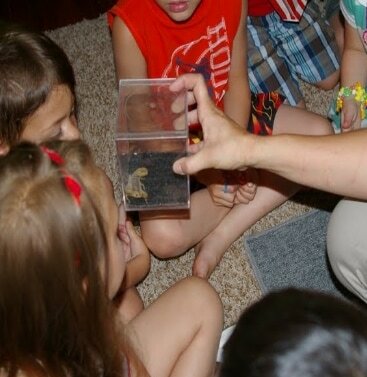 You can mix and match between the Feathered Friends and Creepy Crawlies to customize your animal guest list. You can choose animals to go along with a particular topic or theme you may have going on or you can mix and match from the different categories to have a variety of different animals. 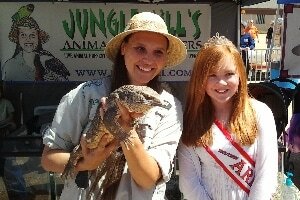 Or if you don't have a specific preference the animal list can be customized to suit your crowd size. Jungle Jill talks a little bit about each animal and also leaves about 5 minutes for questions and answers at the end of the program. Some of the animals are hands on and some of them are not. 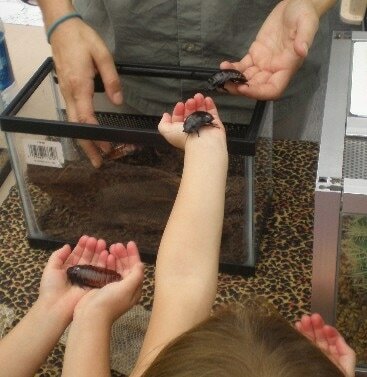 However, touch-ability of the animals also depends on the number of people at the show. This show can be suitable for any group size, but smaller groups (20-30 people) get to do more hands on. If it is a larger group, audience volunteers will be utilized to come up and help throughout the show to make it as interactive as possible. The show content is geared towards the age range of people in attendance. It is great for all ages as well as for audiences of mixed ages! THIS IS A GREAT OPTION IF YOU HAVE A LARGE EVENT WITH MANY THINGS TO SEE AND DO. 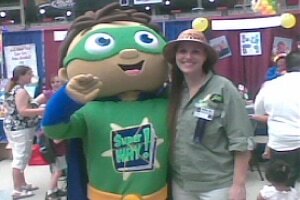 If you have a large event with many things to see and do and people won't want to commit to sitting for a 45 minute 'presentation show' as mentioned above, Jungle Jill can do a few shorter, 15-20 minute, back to back shows. These programs will be as described above in the 'presentation show', however there will 5-6 animals instead of 10 animals due to the shorter length of the programs. Many guests can rotate through a smaller sitting area in a shorter amount of time while still being able to experience all of the other activities at your event. The shorter show style presentation runs $300 for the first hour and $150 for each additional hour thereafter. Other options are available. We can vary programs to meet the needs of your event, budget, event size and event length. Just ask! !